It's a weird Halloween spook-tacular! From a school secretary with a haunted house to a teaching assistant who might be a vampire, A.J. and the gang from Ella Mentry School have had some weird and wacky Halloween nights. 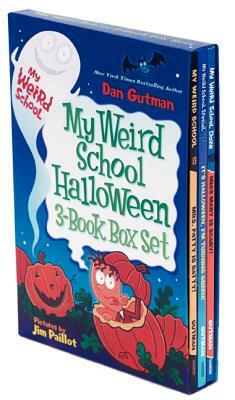 But it's no trick: you can find all three Halloween adventures in this one box, including My Weird School Special: It's Halloween, I'm Turning Green!, which features thirty-two pages of bonus trivia, puzzles, and games, My Weird School #13: Mrs. Patty Is Batty, and My Weird School Daze #10: Miss Mary Is Scary.